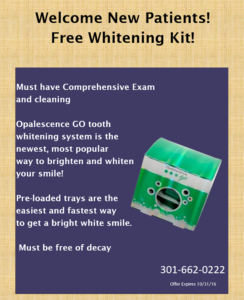 Frederick MD Dentist | New Patient Special Offer! Frederick, MD Dentist | New Patient Special Offer! We are featuring special offer for our new patients – tell a friend! From now through October 31, new patients can receive a free Opalescence Go take-home whitening kit with their comprehensive dental exam and cleaning*. Opalescence Go is a new, safe, and effective way to whiten and brighten your smile quickly and easily in the comfort of your own home. Contact our office for details or to schedule your new patient visit. *Patient must be free of decay to be eligible for whitening.